Labour Against the Witch Hunt Rocked by New Anti-Semitism Scandal. Exclusive: Downing Answers the “Great Lie”. Socialist Fight Faces Call to be Purged from Labour Against the Witch Hunt. So begins an article in the august pages of the Weekly Worker. It is a fact that the Labour Party’s witchhunt primarily takes the form of the weaponisation of anti-Semitism – the smearing of people as anti-Semitic for no other reason than their support for the Palestinians and opposition to Zionism. But apparently it is not a ‘”smear” to say the following. Not wrong, just politically misjudged…. One might ask who were those who supported the right of Socialist Action to participate? Are they not also guilty of supporting anti-Semitism? 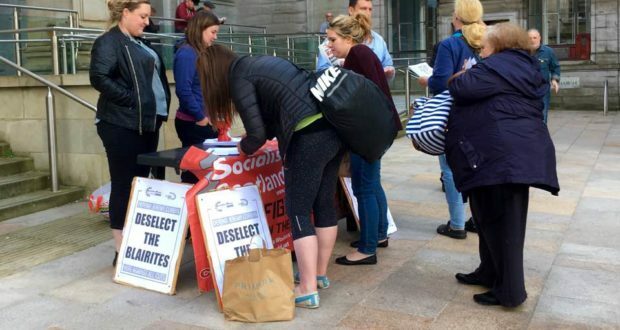 Will Socialist Fight and its backers be physically prevented from attending future LAW meetings? An investigative team of top international journalists found this statement on Gerry Downing’s Facebook Page. In his attack on Socialist Fight in the current Weekly Worker Tony Greenstein calls for the witch hunt to be stepped up until we are driven out of Labour Against the Witchhunt (you couldn’t make it up) and obviously from the entire labour movement, to complete the work begun by Guido Fawkes, David Cameron, Iain McNicholl and John Lansmam because, amongst other equally ridiculous charges to refer to “the Jewish bourgeoisie” is antisemitic. Here is the great lie, the old Trotsky fascist amalgam of the 1930s “Ubi est Nin? In Salamanca o Berlin” from the Spanish civil war (the POUM leader had defected to the fascists was the big lie – in fact the Stalinist GPU tortured him to death and still he refused to ‘confess like the defendants in the contemporaneous Moscow Trials). Jimmy Reid’s attack on the miners’ strike and on Arthur Scargill in the Sun; the far right and militant workers’ leaders like Scargill were ideological blood brothers, he raved. And Trotsky was in the pay of Hitler and Japan to overthrow the USSR etc, the basis of the Great Purges and the Moscow Trials…. The thinking seems to be that Gerry Downing and Ian Donovan and Socialist Fight are trying to get Tony Greenstein and Jackie Jacqueline Walker and Mark Wadsworth expelled from the Labour party by their antisemitism so must be driven out of the labour movement to prove to Iain McNicholl that we are certainly no revolutionary Trotskyists and would never consider such ridiculous notions as world revolution. More here (It is a public page). Supporters of Downing and Donovan point to his sterling work for LAW and predict a dire future for their respected comrades. To our considerable relief and greatly to the credit of those attending the meeting, the proposal to exclude Socialist Fight from the Labour Against the Witchhunt campaign, made by the three members of the executive, was rejected. In fact, two votes were held effectively on the proposed exclusion, one was closely lost and one slightly different but in effect the same was tied, therefore also falling. Our own broader motion was lost 5 votes for, 8 against and 8 abstentions. And in any case, anyone with any knowledge of me knows my antipathy to Gerry Downing in particular is long standing. I will not share a platform with Downing or Donovan because their ideas lead in the direction of anti-Semitism, as well as to ‘the socialism of fools’. 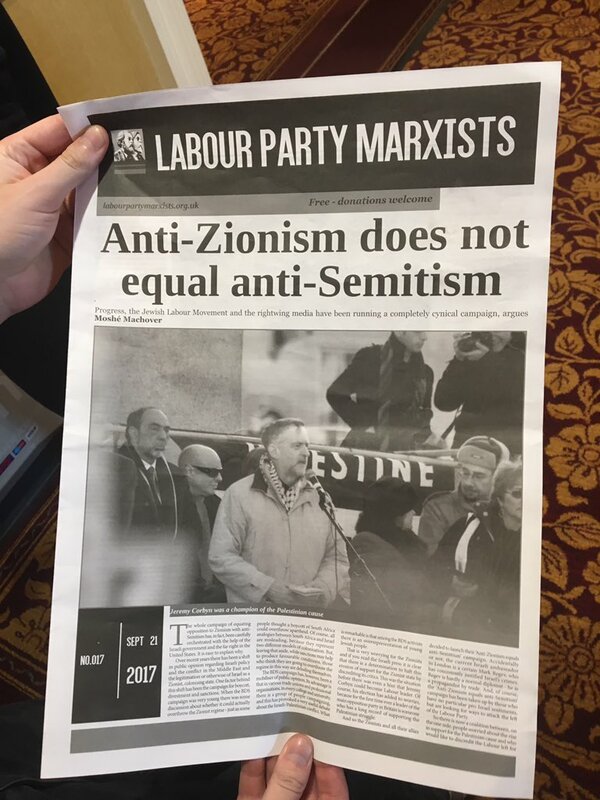 Calls to Expel “Labour Party Marxists” for Leaflet alleging “Zionist-Nazi connection” and “collaboration”. Jeremy Corbyn has been called on to investigate a left-wing group accused of producing and circulating antisemitic literature on the fringes of Labour’s conference. Labour MPs and the Holocaust Educational Trust demanded a personal intervention by the Labour leader to identify and discipline members of the Labour Party Marxists group, which disseminated a leaflet quoting a prominent Nazi. The organisation is not affiliated with Labour officially, but James Marshall, a senior figure in the group, said that all of its supporters, including himself, were card-carrying members. As the row threatened to overshadow the party’s four-day gathering, the Labour leader of Brighton & Hove council warned that it could be the last time the party hosts its conference in the seaside town unless it gets a grip on the problem. Warren Morgan said he was very concerned at “the antisemitism being aired publicly in fringe meetings and on the floor of conference”. Mr Livingstone, 72, has been disciplined by the party for comments he made about Hitler last year and is banned from holding office in Labour until next April, but is still a member of his local party. A heated debate took place in the conference hall on a rule change on antisemitism. Mike Katz, a delegate from the Jewish Labour Movement, welcomed Mr Corbyn’s backing for the new rule, which strengthens the party’s disciplinary process for dealing with antisemitic and other forms of prejudicial views and behaviour. Yesterday the Equalities and Human Rights Commission said Labour needed to do more to prove it was not a racist party. Mr Corbyn rejected accusations that Labour had become the new “nasty party”. “Nobody should be abused, whoever they are,” he said. 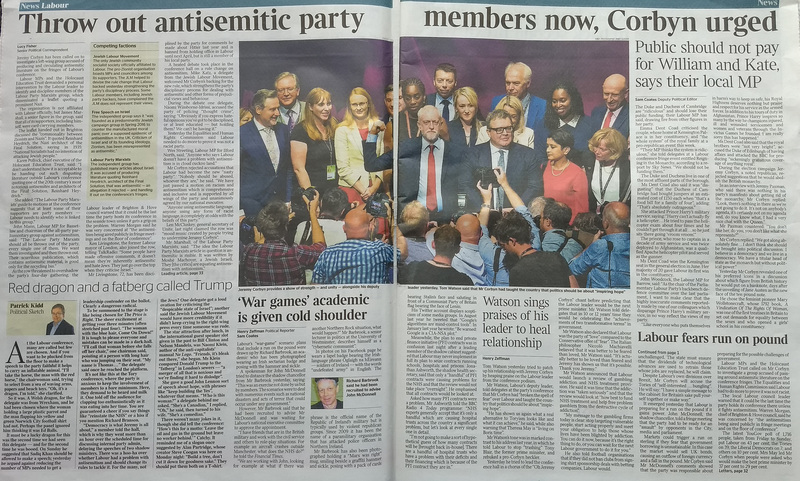 “We have just passed a motion on racism and antisemitism which is comprehensive and inclusive and is supported by all wings of the party and unanimously agreed by our national executive. Len McCluskey, general secretary of Unite, last night claimed the row was “mood music created by people trying to undermine Jeremy Corbyn”. The only Jewish community socialist society officially affiliated to Labour. The pro-Zionist organisation boasts MPs and councillors among its supporters. The JLM helped to devise the rule change that Labour backed yesterday strengthening the party’s disciplinary process. Some Labour members, including Jewish party backers, have complained the JLM does not represent their views. The independent group has published many articles about Israel. It was accused of producing literature quoting Reinhard Heydrich, architect of the Final Solution, that was antisemitic — an allegation it rejected — and handing it out on the conference’s fringes. And here the article by Moshé Machover, a lifelong anti-Zionist Jewish Israeli campaigner. Most of the article is Moshé’s well known views on the topic of Israel and Zionism. But this breaks, dare one say it, new ground, in its explicit linking of Zionism with Nazism. Let us turn now to the Zionist-Nazi connection. In fact it sounds more shocking than it is, because we are talking about the early days of the Nazi regime. Today the holocaust is taught in schools, so people may know when the policy of extermination of Jews actually started officially – in January 1942, when a Nazi conference was convened in Wannsee under the chairmanship of Reinhard Heydrich. Heydrich was second in command to Heinrich Himmler, the head of the SS. The minutes of this conference are actually online and in them a change in policy towards the Jews, ratified by the Führer, was declared. Although it is phrased euphemistically, it is clear that what was being talked about was both deportation to the east and extermination. This change occurred following the attack on the Soviet Union, when the Nazis felt they had to find different ways of dealing with the ‘Jewish problem’. Until that time the official policy was for the exclusion of the Jews from political and civic life, for separation and for emigration. Quite naturally the Zionist leadership thought this set of policies was similar to those of other anti-Semitic regimes – which it was – and the Zionist approach was not peculiar to the Nazi regime. The founder of political Zionism, Theodor Herzl, had pointed out that anti-Semitic regimes would be allies, because they wanted to get rid of the Jews, while the Zionists wanted to rid them of the Jews. That was the common interest. In 1934 the German rabbi, Joachim Prinz, published a book entitled Wir Juden (‘We, the Jews’), in which he welcomed the Nazi regime. That regime wanted to separate Jews from non-Jews and prevent assimilation – as did the Zionists. Philip Roth’s novel, The plot against America, is based on actual people, including Prinz, who emigrated to America and became a leader of the US Jewish community – the fact that he was a Zionist is not mentioned. Of course, the allegation that the idea of extermination originated with the grand mufti has been rejected with contempt by serious historians, but Netanyahu was at least correct in saying that emigration, not extermination, was indeed Nazi policy until the winter of 1941-42. Let me repeat: we must go on the counterattack against the current slurs. It is correct to expose Zionism as a movement based on both colonisation and collusion with anti-Semitism. Don’t apologise for saying this. If you throw the sharks bloodied meat, they will only come back for more. At the moment the left is apologising too much, in the hope that the right will let up. They never will. I am not alone is being deeply saddened by this. The evidence was there in Brighton if you were willing to see it. There were the Labour party Marxistshanding out a paper that repeated Livingstone’s toxic claim of ideological solidarity between the Nazis and those German Jews who sought a Jewish homeland. There’s the testimony of John Cryer MP, who sits on Labour’s disputes panel. He says some of the anti-Jewish tweets and Facebook posts he has seen from Labour members are “redolent of the 1930s”. There were loud calls for the expulsion of Jewish groups, one of which has been part of the Labour movement for a century. Hardly a surprise that some Jewish activists turned away from the conference, describing an atmosphere that felt too hostile to endure. But no – for Len and the Kens and their allies, it’s all made up. Perhaps they don’t realise that that itself is a tired anti-Jewish trope: that Jews invent stories of suffering to drive a secret political agenda. Or, to put it more simply, that there is a Jewish conspiracy. (1) Labour Party Marxists was set up by supporters of The Communist Party of Great Britain (Provisional Committee), notably Stan Keable. It is an offshoot of what it better known as the Weekly Worker. Their membership is generously estimated at 20. The Weekly Worker has been a small faction within every left regroupment going, from the Socialist Alliance, Respect, Left Unity to the LRC. The paper publishes, apart from Moshé Lewin, who until now was respected on the left, numerous articles on ‘Zionism’ by Tony Greenstein. “Two Jewish underground organisations fought in the Warsaw Uprising: the left wing Żydowska Organizacja Bojowa (ŻOB) founded in July 1942 by Zionist Jewish youth groups within the Warsaw Ghetto; and the right wing Żydowski Związek Wojskowy (ŻZW), or Jewish Military Union, a national organization founded in 1939 by former Polish military officers of Jewish background which had strong ties to the Polish Home Army, and cells in almost every major town across Poland. However both organisations were officially incorporated into the Polish Home Army and its command structure in exchange for weapons and training. Marek Edelman, who was the only surviving uprising commander from the left-wing ŻOB, stated that the ŻOB had 220 fighters and each was armed with a handgun, grenades, and Molotov cocktails. His organization had three rifles in each area, as well as two land mines and one submachine gun. Due to its socialist leanings, the Soviets promoted the actions of ŻOB as the dominant or only party in the Warsaw Ghetto Uprising, a view often adopted by secondary sources in the West. The right-wing faction ŻZW which was founded by former Polish officers, was larger, more established and had closer ties with the Polish resistance, making it better equipped. Zimmerman describes the arm supplies for the uprising as “limited but real”. Specifically, Jewish fighters of the ŻZW received from the Polish Home Army: 2 heavy machine guns, 4 light machine guns, 21 submachine guns, 30 rifles, 50 pistols, and over 400 grenades for the uprising. During the Warsaw Ghetto Uprising, ŻZW is reported to have had about 400 well-armed fighters grouped in 11 units, with 4 units including fighters from the Polish Home Army. Due to the ŻZW’s anti-socialist stand and close ties with the Polish Home Army (which was subsequently outlawed by the Soviets), the Soviets suppressed publication of books and articles on ŻZW after the war and downplayed its role in the uprising, in favour of the more socialist ŻOB. Weekly Worker Letter of the Year. Every week your letters page is clogged up with tedious, long-winded guff by Steve Freeman and Gerry Downing. Can we please have a moratorium on this until I’m dead. My son will contact you when the inevitable happens. If I have to read any more of their crap, that day will be a lot sooner. Please! Weekly Worker. Issue 1164. 20th of July. Doug is an old comrade. The Respectable Revolutionaries: Leamington Anti-Racist AntiFascist Committee 1977-1981. Doug Lowe. My own criticism is that he could have added that we have all had enough of Monster Raving Greenstein as well. Labour Party Marxist Call for People’s Militias on Labour’s Agenda? Organise People’s Militia on a Big Scale, Says Labour Party Marxist. As the Socialist Party instructs the Labour Party to deselect 172 Labour MPs, and campaigns for “a new mass workers’ party that can draw together workers, environmental and community campaigners, anti-capitalist, anti-war and other protesters to represent and fight for the interests of ordinary people” more radical forces are gathering. The “coup” may have failed this time, but as the People’s Assembly and Seamus Milne’s defence against the attempted Tory ‘coup’ last year showed, only a “people’s militia’ solidly based on the working class can defeat our enemies. Communists do not want such an army to be “fit” for war or anything else – we want it to be scrapped and replaced with a universal people’s militia. We should not spend our time envisaging a land war between Britain and Russia, but rather a people’s defence against counterrevolution, whether internally or externally – the main emphasis being on the internal. A democratic defence policy that guards the people, not the ruling classes and their property. The position of the Weekly Worker/Labour Party Marxists demonstrates the ‘actuality of the militia’, as outlined in L’Armée nouvelle by Jean Jaurès (1911, re-issued in 1915) which called for universal military training in France to replace the old ‘caste’ of officers and professionals. One can see that, like Podemos, which has many admirers on the left, Jaurès went straight against the ‘casta’. The experience of Western Europe has shown how utterly reactionary the standing army is. Military science has proved that a people’s militia is quite practicable, that it can rise to the military tasks presented by a war both of defence and of attack. Let the hypocritical or the sentimental bourgeoisie dream of disarmament. So long as there are oppressed and exploited people in the world, we must strive, not for disarmament, but for the arming of the whole people. It alone will fully safeguard liberty. It alone will completely overthrow reaction. Only when this change has been effected will the millions of toilers, and not a mere handful of exploiters, enjoy real liberty. ..the standing army to be replaced by the arming of the whole people. No issue could be more pressing……..
Is Petitioning Enough to Fight Next Coup? The Letters the Weekly Worker Dare not publish. Letters the Weekly Worker Dare not publish. Defend Lindsey German and John Rees! The attacks in the Weekly Worker against the Stop the War Coalition (StWC) must cease. The bourgeois onslaught against the anti-imperialist Iranian Republic is nothing but a cover for attacks on the anti-Zionist credentials of Jeremy Corbyn. As I have stated at my ward meeting of Brighton Labour Party, Cds Rees and German were right to refuse to affiliate the so-called Hands off the People of Iran (HOPI) to the StWC. Had this happened it would have meant a de facto alliance with the worst elements of bourgeois chauvinist Nick Cohenite Eustonism. We pledge our undying allegiance to the Caliphate. Death to the Kufur! John T. Mark Anthony Smith, Momentum. Liquidation of the Remnants of the Bukharin-Trotsky Gang of Spies, Wreckers and Traitors to the County. The Trotskyite rabble, clutching their so-called Transitional Programme to their flaccid chests, are sabotaging the long and glorious road of the remarkable victories of the Baath Party in Syria. Free from opportunism, irreconcilable towards the capitulators, and revolutionary in its attitude, Baathism is proceeding to a decisive triumph. Comrade Assad, the genius of the Syrian revolution, has nevertheless, perforce, received snivelling criticism by the so-called Trotsky human rights supporters, i.e. alien, wrecking and spying elements. In a circular letter to all organisations dated December the 22nd 2015, on the subject of the registration, safekeeping and issuance of Party cards, the CPGB (Provisional Central Committee) it is stated that we must ensure the careful verification of the records of all Party members to ensure “Bolshevik order in our own Party home”. The English republic of Southwark and Bermondsey, South Londoners Against the Corn Laws, must protest against the recent statements made by the Fourth International. James Connelly would have blessed himself with holy water to hear the carping views of Liam on the Thanksgiving Uprising. Did not Cromwell teach the Irish the lessons of socialist republicanism? The Fourth International and Left Unity should rename themselves socialist republicans forthwith. The Walmington-on-Sea Workers’ Militia is appalled to learn that the People’s Assembly blocked all discussion of the arming of the proletariat at its recent conference. Our battalion has been in training since the PA called for action against a possible Tory Coup last summer. We remain on high alert in view of coming referendum on Europe. My men are as keen as mustard: ready to go to fight Jerry. Plus and minus are dialectically related. Sometimes two plus two equals five. You are stinking poos and mingy moos.